All-rounder with GeForce GT 630M. Acer is one of the first manufacturers to build in the brand new GeForce 600 series from Nvidia. 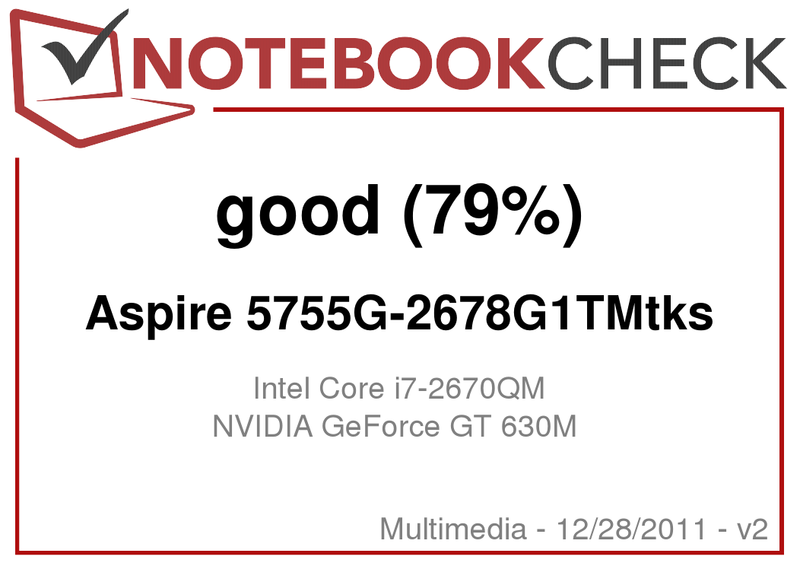 The battery life of the Aspire 5755G isn't to be neglected either, despite the installed quad core CPU and midrange GPU: The Optimus technology makes it possible. The stylish design and attractive price are other selling points. 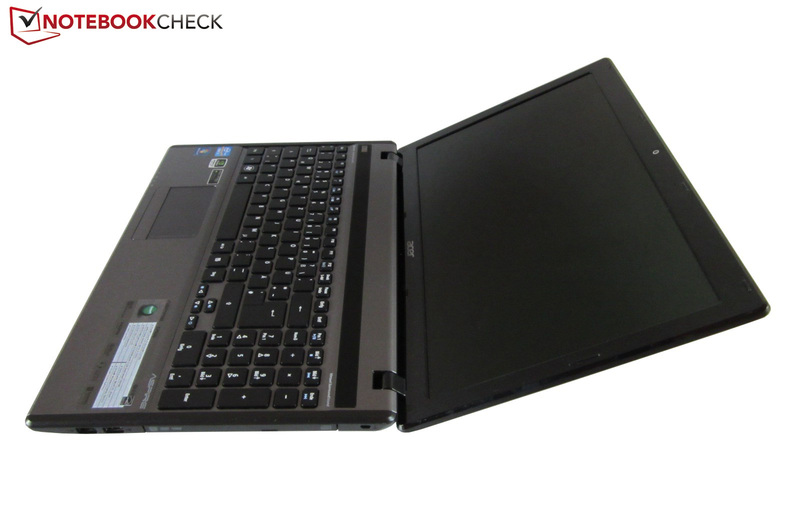 The range of multimedia notebooks is so immense that even experts quickly lose the overview. Just alone Nvidia's GeForce GT 540M is installed a multitude of times. It's not easy to find the right device in this downright vast mass of laptops. 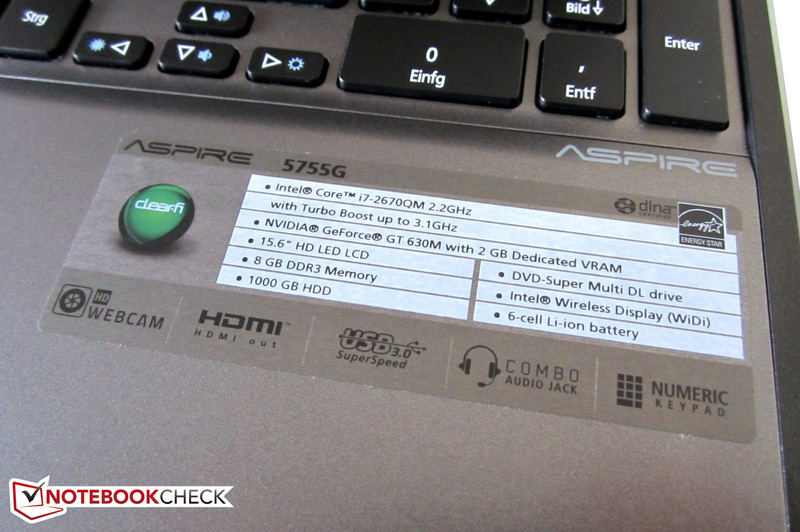 Acer has launched an interesting candidate with the latest hardware called Aspire 5755G-2678G1TMtks. 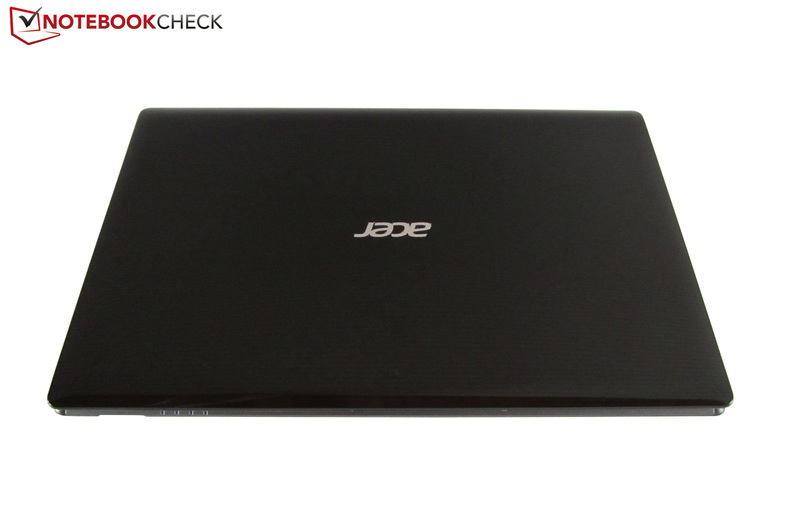 The 15 inch multimedia machine not only has an Intel quad core Sandy Bridge processor (Core i7-2670QM) but also eight GB of DDR3 RAM and a 1000 GB HDD. Nvidia's newest midrange model, GT 630M, is used as the graphics card. Another highlight is the dynamic graphics switching that ensures moderate power consumption. The price: nearly €900. If a BluRay drive is to be included, there is the model 2678G1TBtks for a surcharge of €100 available. 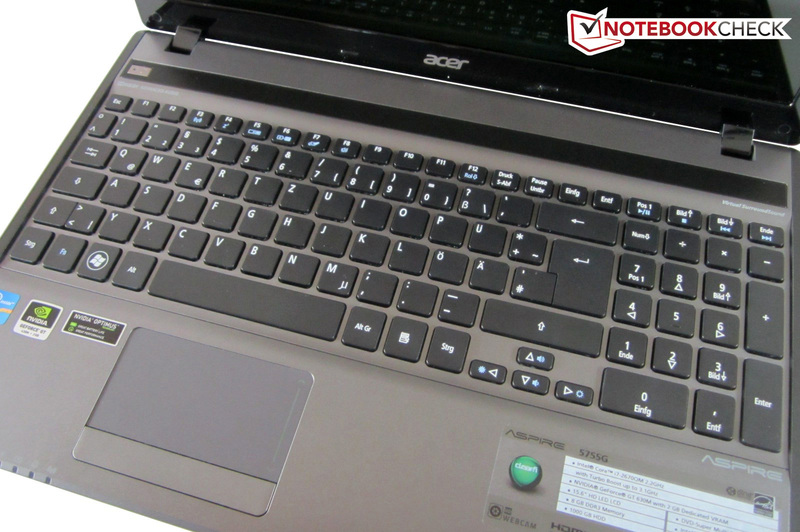 Whether Acer has set up a successful total package or if cutbacks have again been made on the screen can be found out in this review. 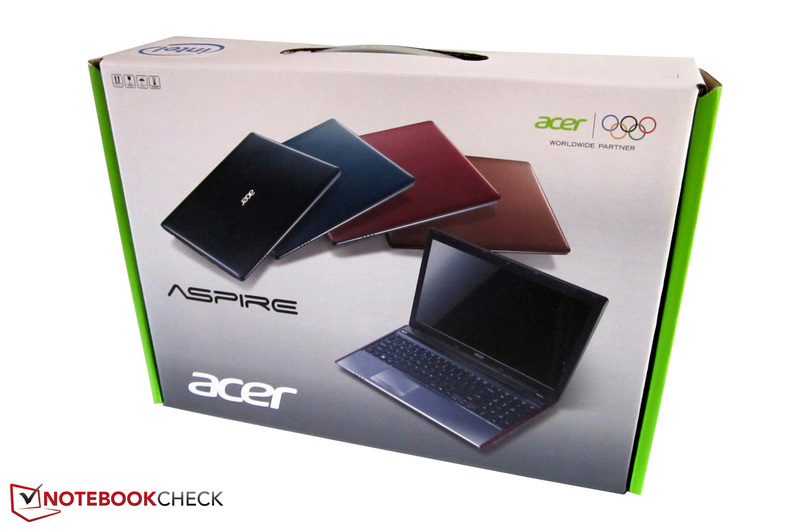 A glance at the box already hints that Acer offers its Aspire 5755G in four different colors. Lid and side surfaces are available in red, brown, blue or black, depending on the model. The keyboard area and wrist rest gleam in a matt silver gray (aluminum look) regardless of the model. Numerous black elements (keyboard, speaker bar & display bezel) supply nice accents. The design and shape are throughout successful. The notebook looks neither conservative nor extravagant. 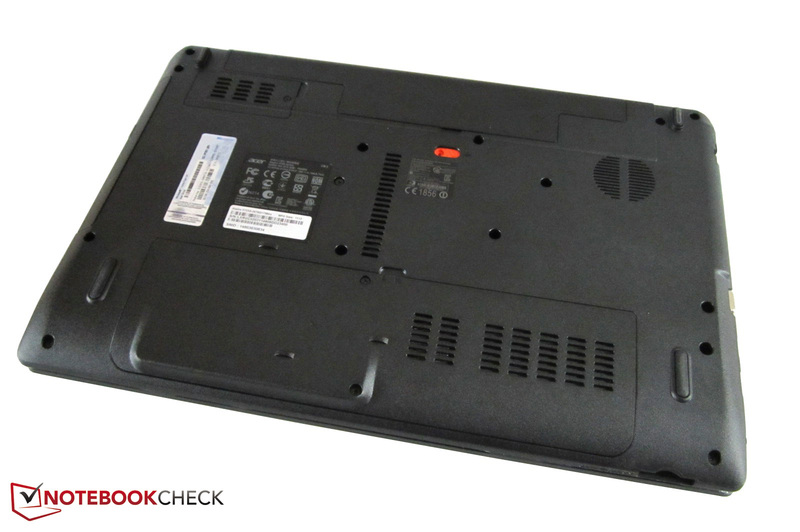 The 15 inch laptop can be carried around comfortably with a weight of 2.6 kilograms. The all-round device makes a good quality impression; the plastic surfaces are well manufactured. Merely the extremely sensitive high gloss lid (fine line texture) doesn't really fit into the overall picture. Furthermore, the stability is unsatisfactory. While the notebook's bottom yields marginally under stronger pressure, the top gives in evidently in the area of battery and drive. The lid isn't particularly rigid either. Moreover the hinges aren't perfect. Although the device can be opened easily with one hand, the screen partly wobbles noticeably on shaky surfaces. A large scope of interfaces shouldn't be expected. Acer limits itself to the most necessary. That is a card reader, three USB ports (1 USB 3.0), two video sockets (VGA & HDMI), two audio jacks (headphone & microphone), an RJ45 Gigabit LAN port and a Kensington lock in the case of the Aspire 5755G. Acer apparently deems FireWire, eSATA and ExpressCard unnecessary. There's also room for improvement in port distribution. 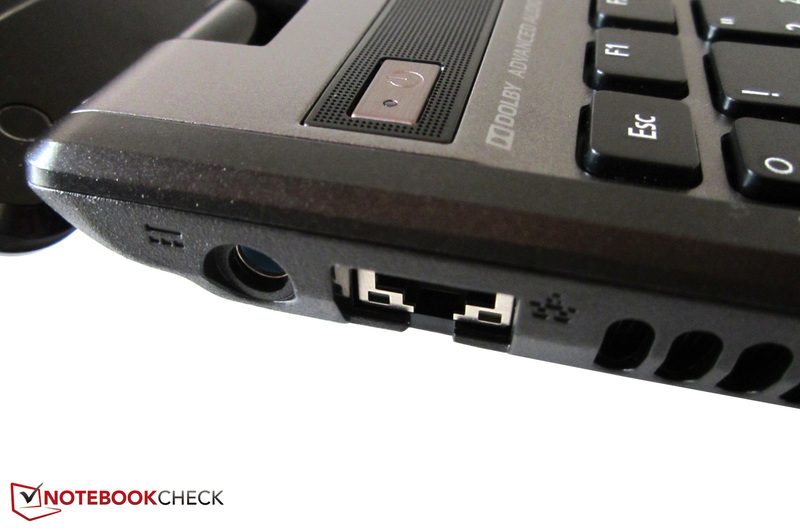 The majority of ports are so far front that connected cables interfere with mouse use. 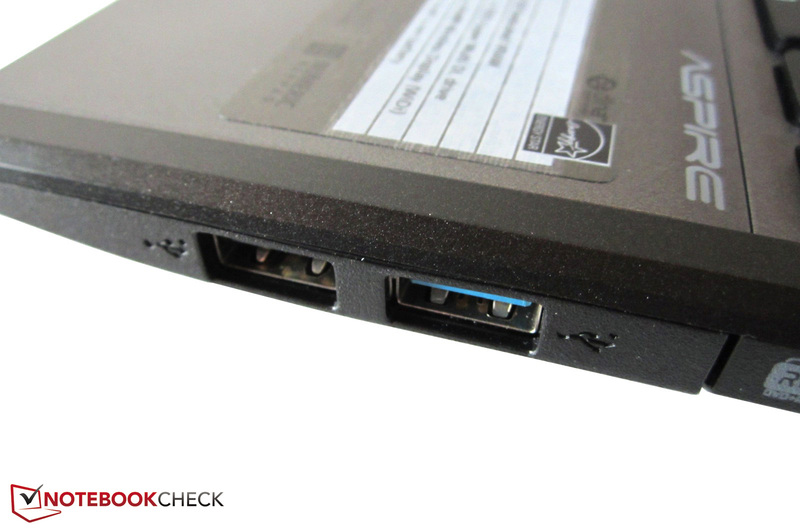 The 15 inch laptop has a small wireless module from Intel called Centrino Wireless N-6205 and that supports WLAN a/b/g/n (2.4 & 5.0 GHz). Bluetooth isn't installed. 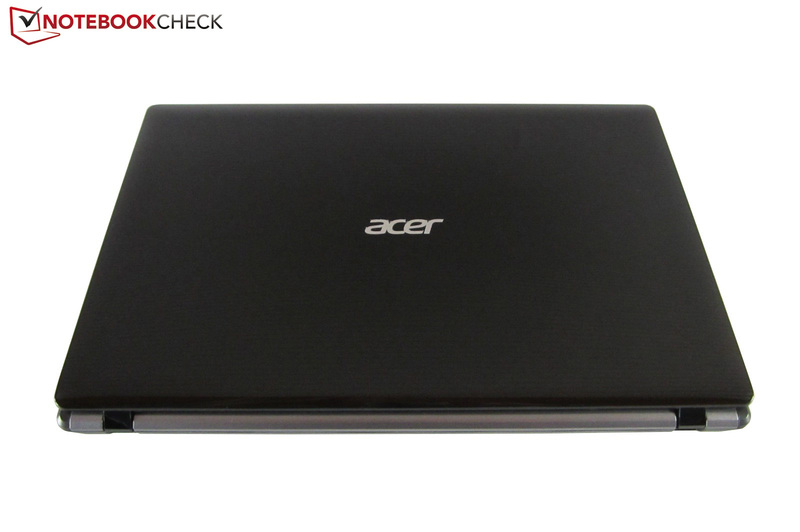 As usual, Acer installs all sorts of bloatware on the multimedia notebook. The 15 inch device first works optimally when certain programs are deleted from the hard disk. The scope of delivery is pretty modest. 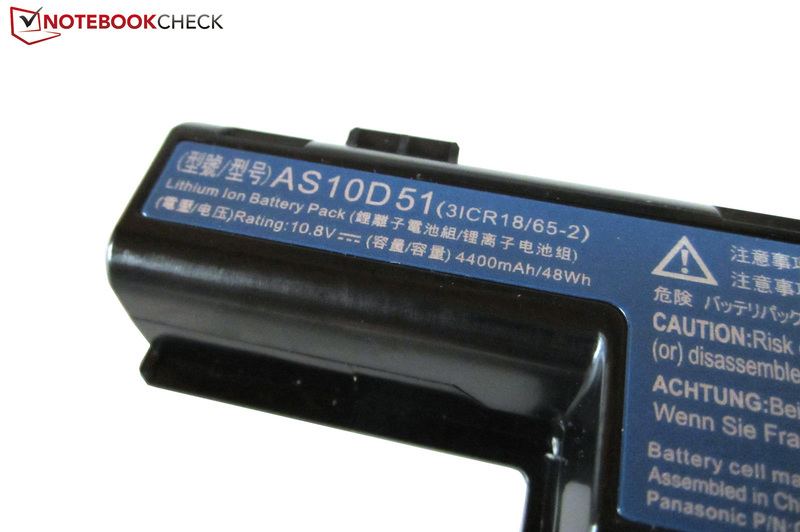 Besides a compact 90 watt power adapter and a wide 6 cell battery, there is only a warranty card and a quick start guide. The buyer has to burn a recovery DVD on his own. The two year warranty is standard in the notebook industry. It is a pick-up & return service. The warranty is valid for one year internationally. 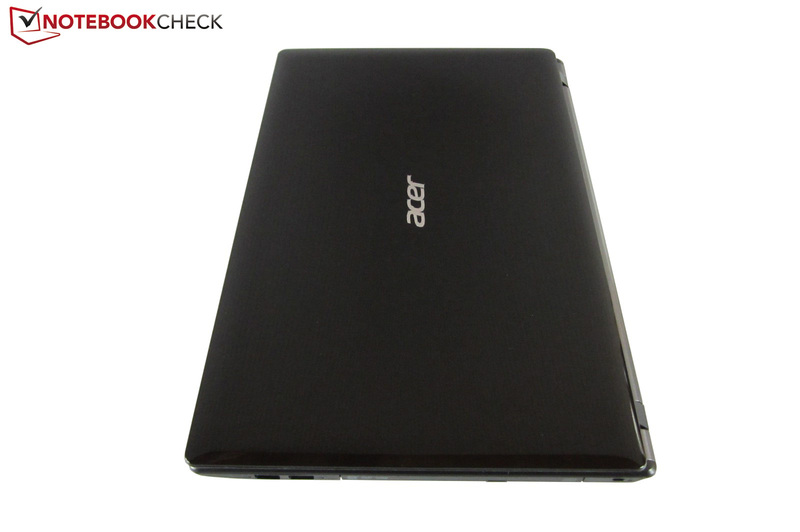 Compared to older devices (see e. g. the Aspire 7750G), a big step forward is evident here. The free-standing keys with a good size of 15x15 millimeters are cleverly arranged and have a well defined pressure point respectively stop. The built-in numpad will also please many buyers. Although the trigger noise isn't exactly high-quality, the sound is all right. The tiny arrow keys will likely annoy some users. 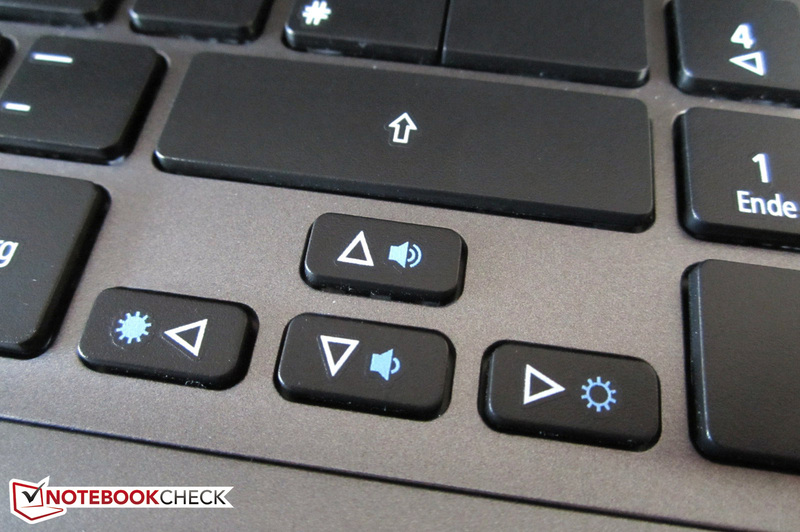 We can't say why Acer hasn't separated the left "shift" key and the "<>|" or the "enter" and the "key" either. 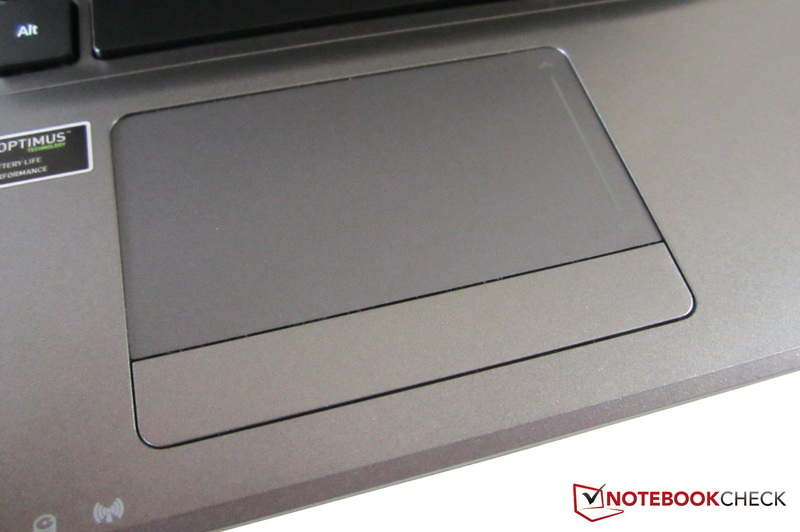 The slightly lowered touchpad especially scores with its multitouch support. Various gestures, such as scroll or rotate, can be implemented with two fingers. 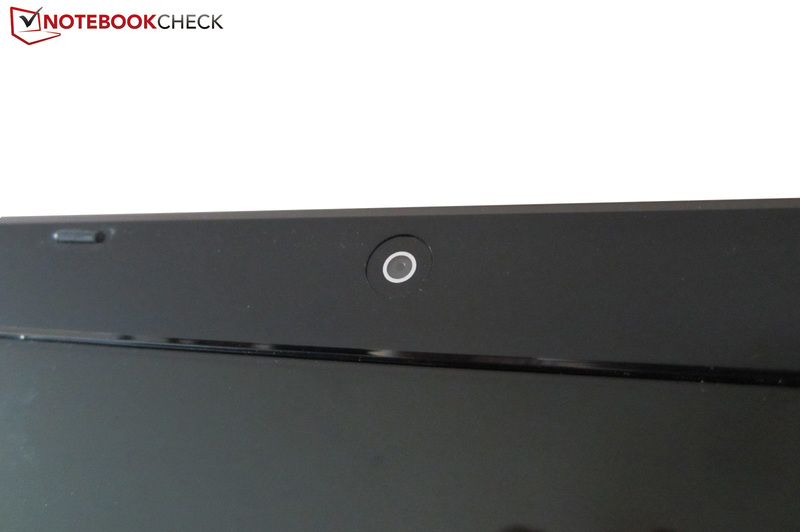 Conventional scroll bars at the touchpad's edge shouldn't be omitted either. The surface is fairly smooth and supplies acceptable gliding traits. In the meantime, a size of 87x47 millimeters isn't exactly big. Apart from that, the touchpad occasionally has a spongy response; the accuracy wasn't always as desired. 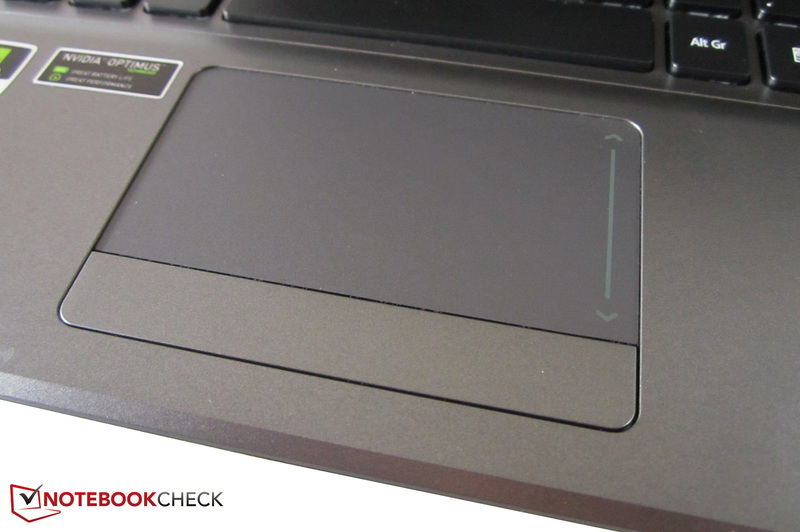 The touchpad can simply be disabled to eliminate the risk of misentries. The mouse keys, united on an unbroken bar, don't give reason for complaint: The pressure feel and typing noise are acceptable. The 15.6 inch glare-type screen has an LED backlight and a resolution of 1366x768 pixels. The low pixel density is particularly noticed in multitasking. Two opened windows already cause serious space problems. The user is forced to rearrange and scroll frequently. On the other hand, gamers will be pleased about the moderate resource requirements - the graphics card isn't loaded too heavily. Good image quality is hoped for in vain. 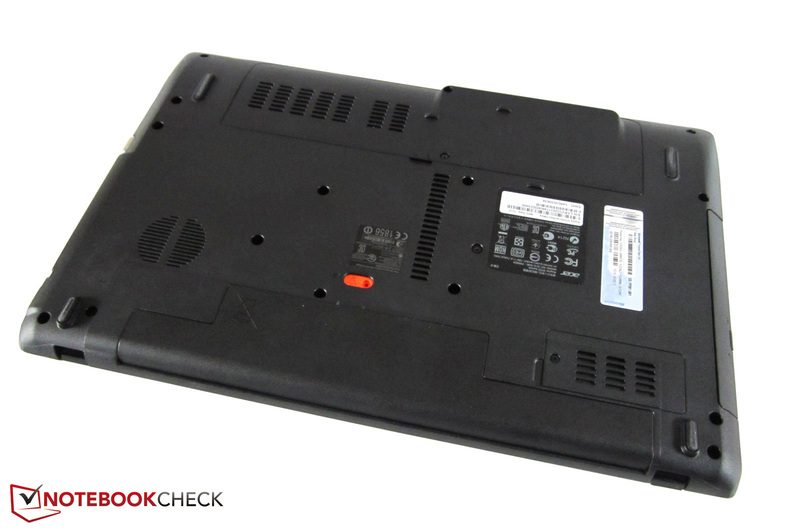 As in many other multimedia devices, Acer only installs a budget screen (AU Optronics B156XW02 V6). The brightness of approx. 217 cd/m2 is good, but the black value of 1.36 cd/m2 won't likely knock anyone's socks off. User who watch a nighttime movie or play a game in the dark will soon be annoyed about the grayish reproduction of dark elements. It can't be called a crisp black; the rate would have to be below 0.4 cd/m2 for that. The contrast is accordingly low: 160:1 are scanty even for a low-cost device. In comparison: Higher quality screens range between 500 and 1000:1 (see e. g. the Asus N75SF). The colors are absolutely disappointing. They look pallid and weak. As can be seen on the following pictures, the screen is remote from covering the sRGB spectrum. However, the end user can ignore this. Videos and games don't come into their own without an external monitor. Although the glare surface hides the moderate image quality, we would have appreciated a matt screen. Reason: Depending on the location and light conditions, intense reflections are created. The reflective surface is especially annoying outdoors. The displayed content can hardly be recognized on sunny days - bad for the eyes. As expected, the viewing angles are fairly narrow. No matter if from left, right, above or below - deviations quickly lead to brightness changes. The notebook isn't suitable as a TV for several people. A new quad core does its job as the processor. The Core i7-2670QM is a member of Intel's popular Sandy Bridge generation and is accordingly manufactured in a 32 nm process. Thanks to 995 million transistors and a 6 MB L3 cache (Core i5 range: max. 3 MB), the quad core ensures a high future security. The clock is increased from its default of 2.2 to a maximum of 3.1 GHz depending on the load. Intel's Turbo Boost technology works perfectly in practical use. While the CPU clocks with 2.9 - 3.1 GHz in single core load, it is an average of 2.8 GHz when all cores are loaded (tested with Cinebench R10). However, the Hyper Threading technology is only an advantage in certain applications. 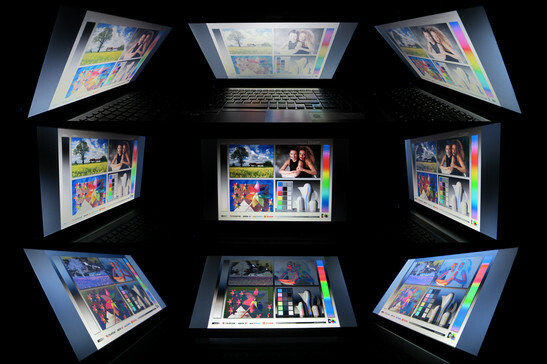 The CPU can process eight parallel threads by simulating four virtual cores. The high performance of course takes its toll: The thermal design power is a whole 45 watts (Core i5 range: max. 35 watts). It's mainly due to the graphics switching that the battery runtimes are nevertheless good. Nvidia's Optimus technology either enables the integrated (HD Graphics 3000) or the dedicated (GeForce GT 630M) graphics unit according to requirement. 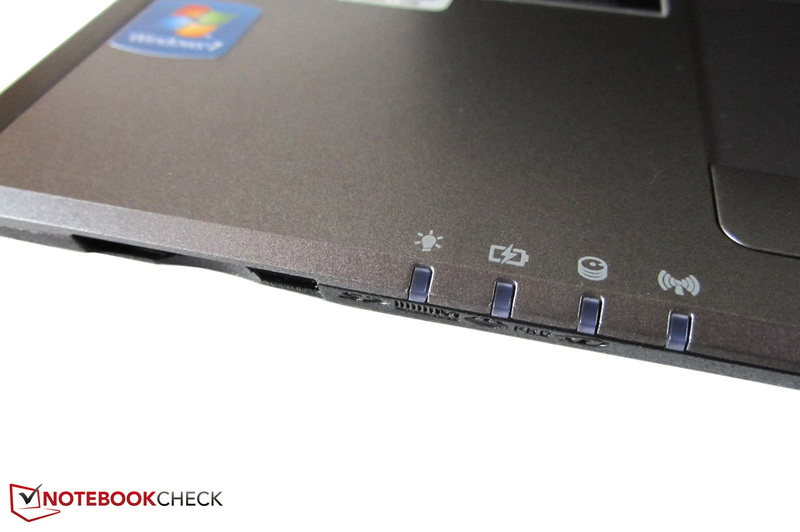 Various tips for optimal use can be found in the review of the Dell XPS 15. The i7-2670QM mastered the CPU benchmarks with flying colors. The dual core members don't even come close to holding a candle to the 17974 points achieved in Cinebench R10 multi core rendering. Even the currently strongest dual core model, i7-2640M (2.8 - 3.5 GHz) has to be content with almost 12000 points. The quad core can also hold its own well in single core rendering: 4914 points approximately correspond to the result of the Core i5-2520M (2.5 - 3.2 GHz). 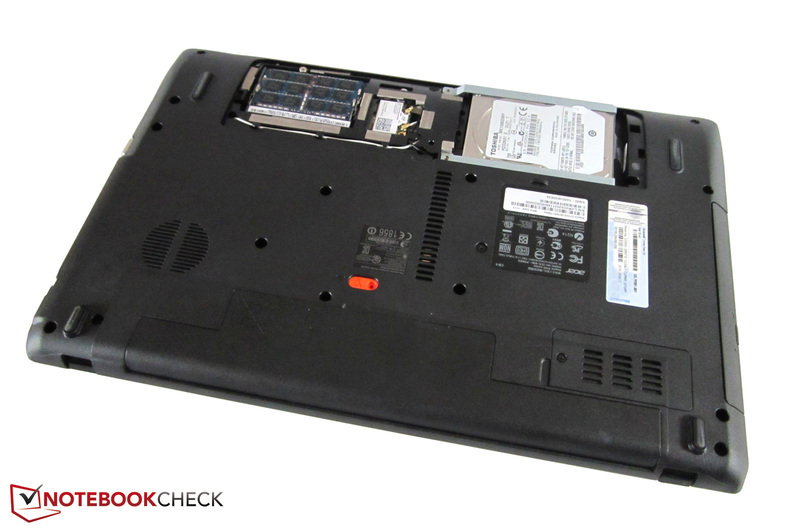 Since games are usually mainly limited by the graphics card (see Sandy Bridge comparison), the dual core CPU would actually be enough in the case of the Aspire 5755G. 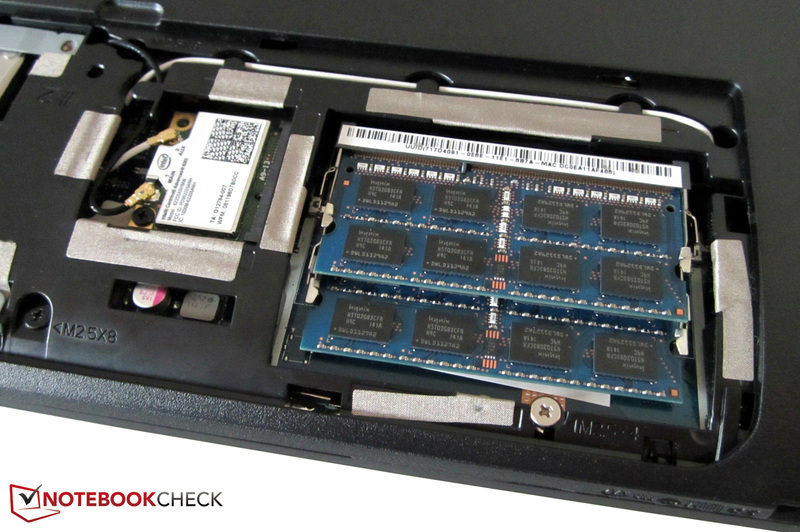 Quad cores are first really worthwhile in high-end laptops. The brand new and DirectX 11 capable GeForce GT 630M is available in two versions, according to Nvidia. First there is a version with 144 unified shaders ("CUDA cores") and a core clock of 525 MHz, and second a version with 96 shader units and a core clock of 672 MHz. 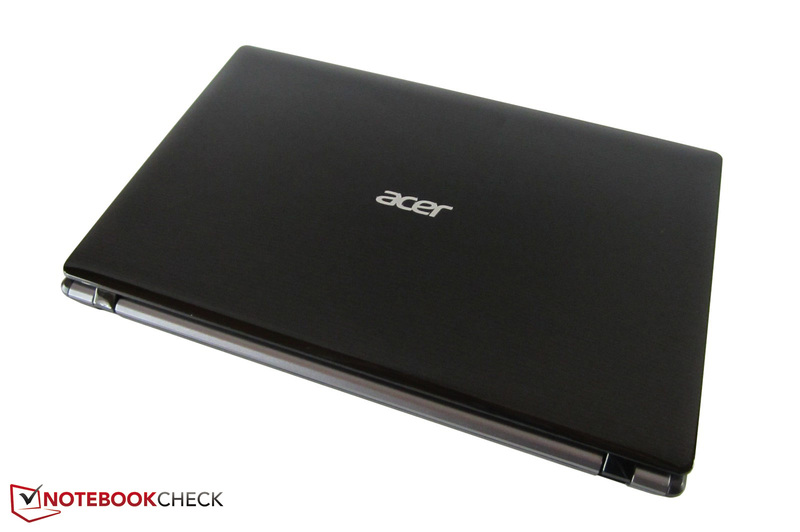 Acer uses the latter version for the Aspire 5755G. Unlike the name indicates, the GeForce GT 630M is ultimately related with the GT 540M (both Fermi architecture). Malicious tongues could now claim that Nvidia has simply renamed the graphics. Alike its fast sister, the GT 630M places itself in the (lower) midfield. The 800 MHz DDR3 video memory is generously sized with 2048 MB, but only has a 128 bit bus. That sometimes lessens the performance (bandwidth: 25.6 GB/s). The GT 630M often doesn't have enough reserves for the PhysX technology (extended physics effects in some games). In return, HD videos run perfectly thanks to the incorporated video processor (VP4). The graphics card even transmits HD audio besides a razor sharp picture via HDMI (Dolby TrueHD & DTS-HD) - this is how we imagine a modern, all-round graphics card to be like. The GT 630M is still produced in a 40 nm structure width (28 nm will first be standard in 2012). Commendable: The latest GPU driver was installed on our test device. In comparison to the processor the performance of the graphics card is significantly lower. The GeForce GT 630M only managed our DirectX 11 benchmarks with effort. 13.3 fps in the Unigine Heaven 2.1 benchmark (1280x1024, high, tessellation normal) indicate that the midrange GPU often finds its limits in modern 3D programs. The according settings are only rendered smoothly by high-end models (GeForce GTX 560M and higher). The GPU score of 3DMark 11 (1280x720, performance presetting) wasn't overwhelming either. The GT 630M places itself behind the main AMD contender, the Radeon HD 6650M (1013 points @Packard Bell EasyNote LS11), by 15% with 862 points. The available performance should be sufficient for average use though. A 1000 GB HDD from Toshiba is installed into the tested Aspire model (5400 rpm). The MK1059GSMP gives quite a good performance with a sequential read and write rate of about 80 MB/s. The access speed of 17.6 ms proves to be average at most. Toshiba naturally doesn't stand a chance against a fast 7200 HDD or an SSD. In case an upgrade is being considered: The hard disk can be exchanged very easily (RAM and WLAN module can also be accessed). Unsurprisingly, the system performance is located in the midfield. 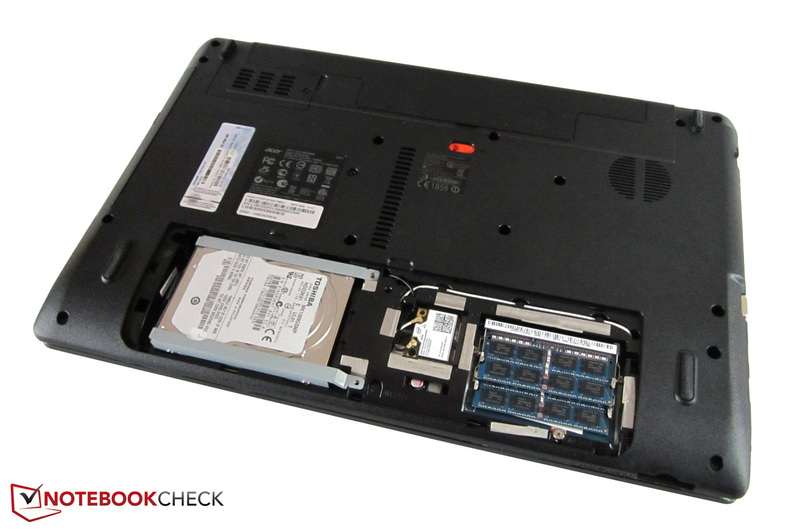 Many all-round laptops achieve between 7000 and 8000 points in PCMark Vantage. An example? The Samsung 700Z5A, equipped with a Core i5-2430M and a Radeon HD 6750M, managed 7118 points in the test. Then again, the Sony Vaio VPC-F22 (Core i7-2630QM & GeForce GT 540M) achieved 7488 points. Since we have the GeForce GT 630M in review for the very first time, the benchmark course was particularly extensive. In order to keep this article manageable, we will focus on five of the latest games. The ForceWare 285.64 served as GPU driver. Welcome to the future! One of the most successful building strategy games dares taking a look in the crystal ball. Anno 2070 isn't only an impressive game, it also looks good. Although the 15 inch device has serious problems with high graphics options, medium details are well playable in the native 1366x768 pixels (30 fps in the intro of the first campaign mission). Other midrange graphics cards, such as the GeForce GT 540M, achieve a similar result (31 fps @Asus U46SV). 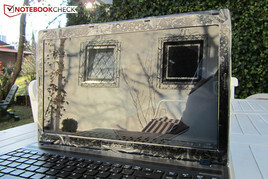 A Radeon HD 6770M (27 fps @MacBook Pro 15) would be the minimum for high detail level. Thanks to its enormous circumference, Skyrim bids entertainment for several weeks and months. Alike Anno 2070, high graphics settings are not stutter-free in the native resolution. The notebook finishes the intro carriage ride with only 19 fps (8x AA & 8x AF). The GeForce GT 630M does a lot better with the presetting "Medium" (four-time antialiasing): The graphics card places itself just behind the GT 540M (32 fps @Asus U46SV) with 30 fps. 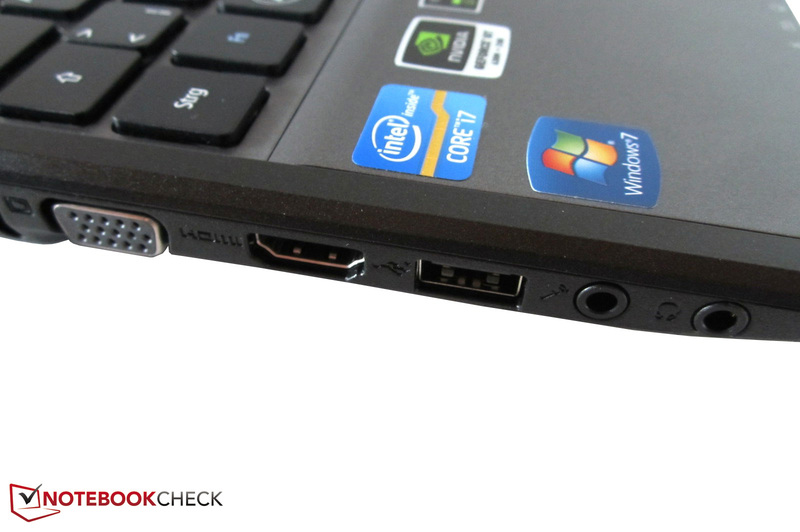 A graphics card from the upper midrange should be installed into the laptop for high details (e. g. a GeForce GT 555M). The multiplayer mode of Battlefield 3 also keeps the player busy for a longer time. The reference-worthy technology unfortunately has a big drawback: The high requirements on hardware. Our demanding benchmark sequence (beginning of the first single player mission) wasn't displayed smoothly in either the high (16 fps) or medium details (23 fps). The first person shooter only showed an acceptable performance with the presetting "Low" (34 fps @1024x768). 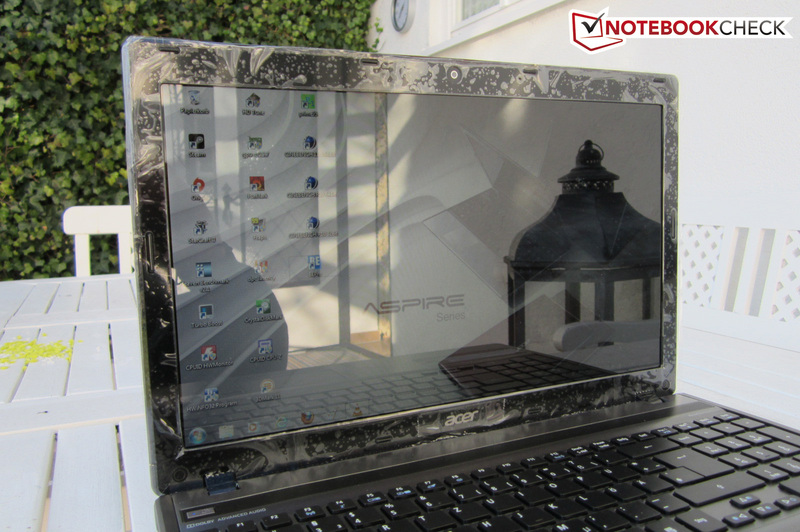 A notebook with a high-end GPU should be used to enjoy Battlefield 3 in its whole beauty. Fifa 12 proves that the GeForce GT 630M doesn't have any problems at all with older and less computing-intensive tracks. The soccer game even rolls smoothly over the screen in high details and two-times antialiasing - 104 fps speak for themselves. The user can play with all settings in the graphics menu and set all controls to full. That's no surprise: The one or other entry level GPU can cope with high details. The Formula 1 race game from the developer, Codemasters, doesn't let the 15 inch laptop stagger. The 37 fps that we determined in the built-in benchmark with 1366x768 pixels, high details (DX11) and two-time antialiasing are a perfect result. Overall, the GeForce GT 630M can show off with a satisfactory gaming performance. However, the performance varies strongly depending on the track. While "normal" games run smoothly even in high settings, it often has to stop at medium details in technically complex tracks (Anno 2070, Skyrim). The power is even only enough for low details in extreme cases (Battlefield 3, Metro 2033). Casual gamers should be content with the GeForce GT 630M anyway. The midrange model is on about the same level as the GT 540M. A higher resolutions than 1366x768 shouldn't be demanded from the graphics card. 1600x900 pixels are first adequately spurred by a GeForce GT 555M or Radeon HD 6770M. The 15 inch device scores with relatively low noise emissions. The fan is always audible in idle, but fairly quiet. 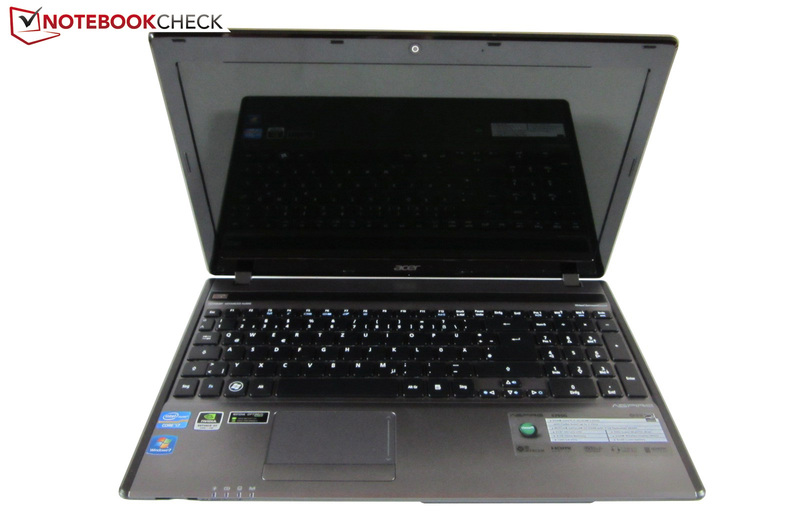 We didn't notice that the Aspire 5755G varied its speed constantly. However, Acer should use another optical drive: The DVD burner sometimes whirs at a very audible level. Otherwise the notebook stays fairly quiet during load. While many contenders reach over 40 dB (A) in normal 3D operation, the meter recorded a maximum of 39 dB (A) even in the stress test (15 cm distance). The perfect laptop for noise-sensitive users? Not quite. Our test device sporadically attracted attention with a (subtle) high-pitched whistle. We can't say if this is a problem with the series or not. 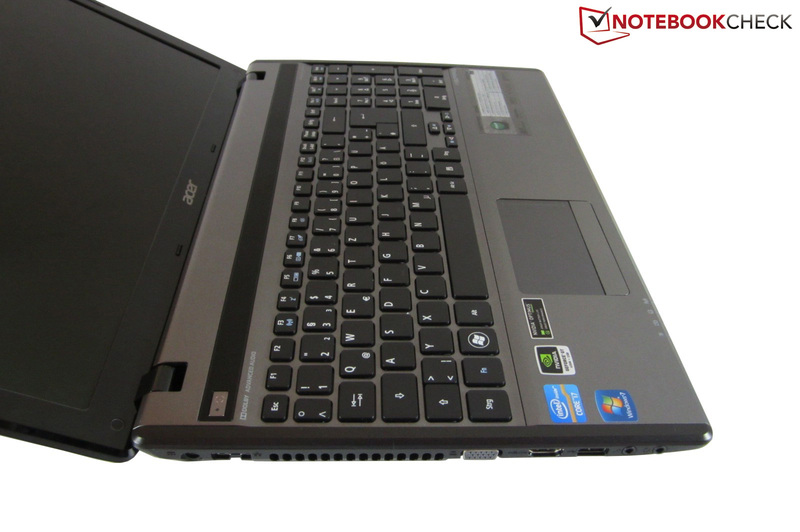 The high temperature development is one of the Aspire 5755G's biggest shortcomings. The components get extremely warm during full load (Furmark + Prime). If we believe CPUID Hardware Monitor, the graphics card and processor heat up to over 90°C. This explains why the Intel quad core temporarily clocks down to 800 - 1600 MHz. 3D applications don't load the hardware as much and consequently throttling isn't an issue. Even the case's surface is anything but cool during load. We rarely measure a maximum of 49°C on the top and up to 58°C on the bottom. But all clear: The 15 inch device doesn't get excessively hot during gaming. The temperatures are completely all right when not much is demanded from the notebook. (-) The maximum temperature on the upper side is 49.4 °C / 121 F, compared to the average of 36.5 °C / 98 F, ranging from 21.1 to 71 °C for the class Multimedia. (+) In idle usage, the average temperature for the upper side is 25.9 °C / 79 F, compared to the device average of 30.9 °C / 88 F.
(-) The palmrests and touchpad can get very hot to the touch with a maximum of 46.1 °C / 115 F.
(-) The average temperature of the palmrest area of similar devices was 29.1 °C / 84.4 F (-17 °C / -30.6 F). The sound quality isn't really impressive despite Dolby Advanced Audio v2. The sound of both stereo speakers is only mediocre. Movies, music and games lack precision, volume and realism. The maximum volume could also be higher. The Asus N55SF and the Dell XPS 15 prove that a better job can be done here. We would recommend using external speakers anyway. Nvidia's Optimus technology ensures agreeably low power consumption in idle mode (9 - 14 watts). 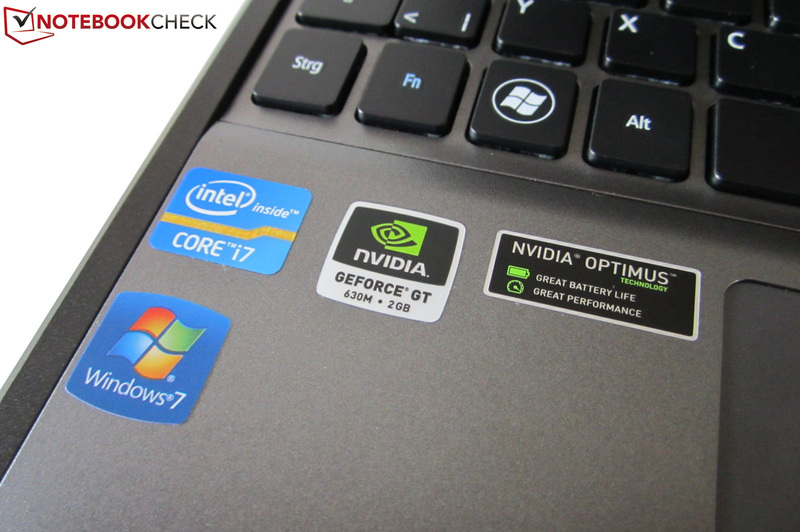 Other multimedia notebooks with a quad core processor, midrange GPU and graphics switching achieve similar low rates (compare e. g. with the Samsung RF511). The load consumption (maximum 89 watts) doesn't give reason for complaint either. Although the 48 Wh battery is rather weak, the runtimes are impressive. More than six hours are possible in idle when the minimum brightness is used. Four hours of wireless surfing on the Internet are possible when medium brightness is selected. We could play a DVD for a bit more than three hours (maximum brightness). Only the runtime during higher load and enabled Nvidia graphics card disappointed us: The notebook only lasted for 59 minutes in BatteryEater's Classic Test. 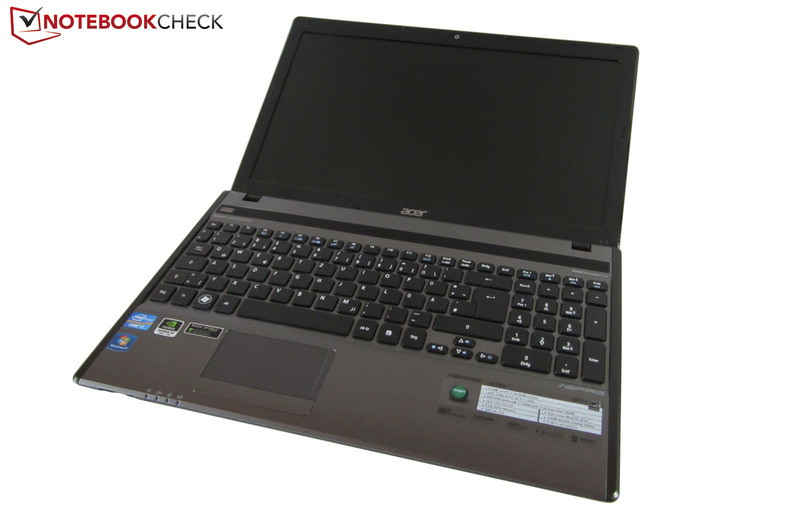 Acer adeptly freshens up its product range with the Aspire 5755G-2678G1TMtks. 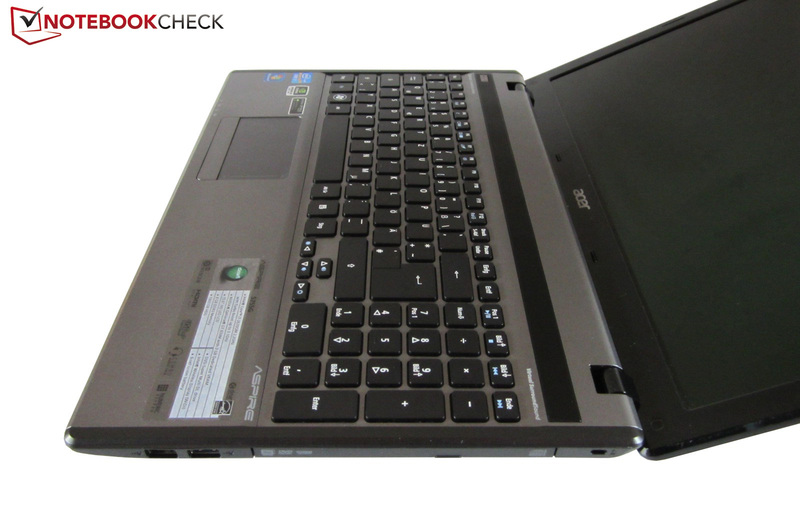 The stylish multimedia notebook can reap in satisfactory to good scores in most tests. 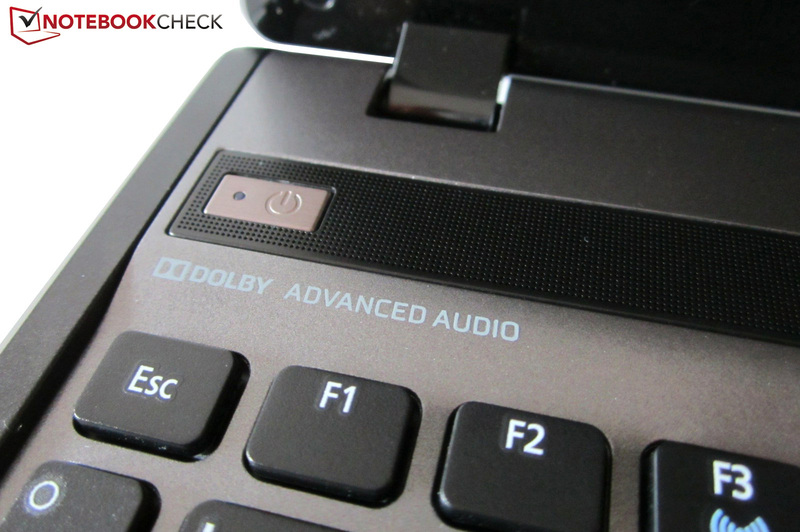 Besides the fast quad core processor and the well designed input devices, we especially think of the moderate noise level. No matter if idle or 3D operation: The 15 inch laptop is never annoying. The battery life is also impressive thanks to the Optimus technology. The multimedia device easily reaches three to four hours when the GeForce graphics card is disabled. However, a few flaws prevent the leap into the 80% range. The reflective screen is unsurprisingly only standard fare. Media entertainment is marred by pallid colors, a weak contrast and narrow viewing angles. The low scope of connectivity (no eSATA, Firewire or ExpressCard), a sensitive notebook lid and a fairly high temperature contribute to that. The components heat up extremely during load. 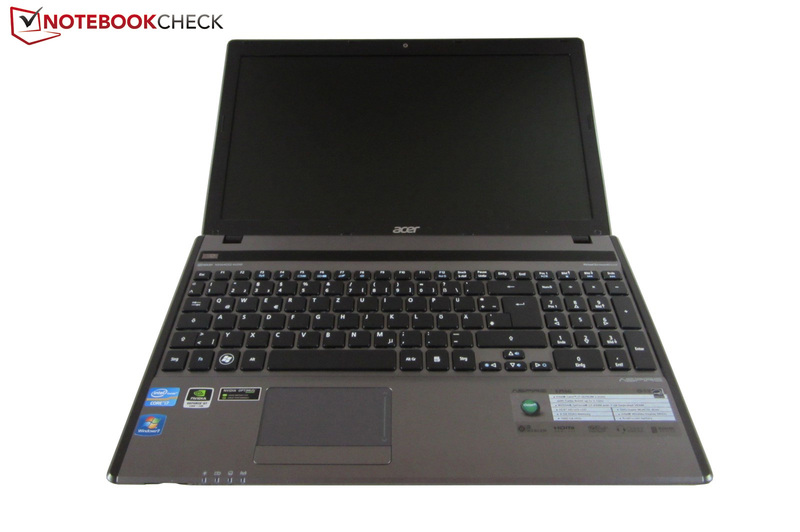 Users who can live with a third-rate screen can give the Aspire 5755G a chance anyway. Not quite €900 is a fair price for what is given. There are a vast amount of alternatives and we would recommend taking a look at our Top 10 chart. The 15 inch laptop is available in red, blue, brown and black. 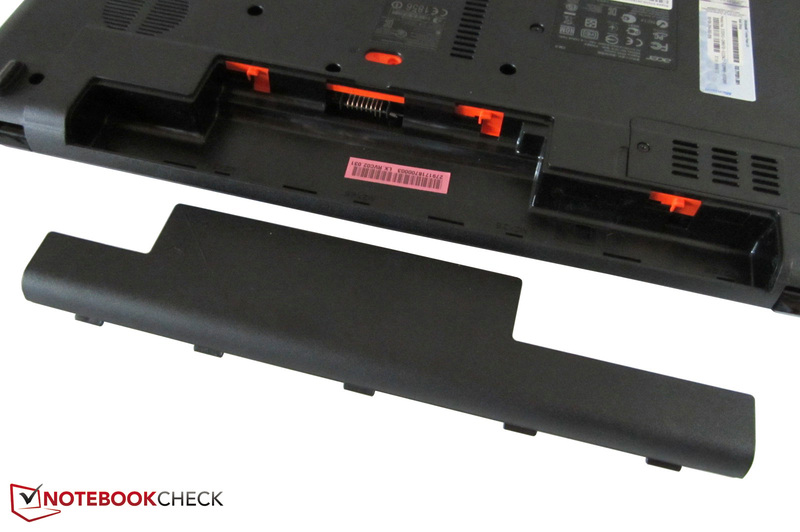 An orange bar has to be pushed to take out the battery. The battery life is absolutely acceptable despite the low capacity. Acer installs a 1.3 megapixel webcam. The multimedia laptop can serve with a dedicated numpad. The speakers are hidden underneath a black bar. Nvidia's Optimus technology helps to save energy. 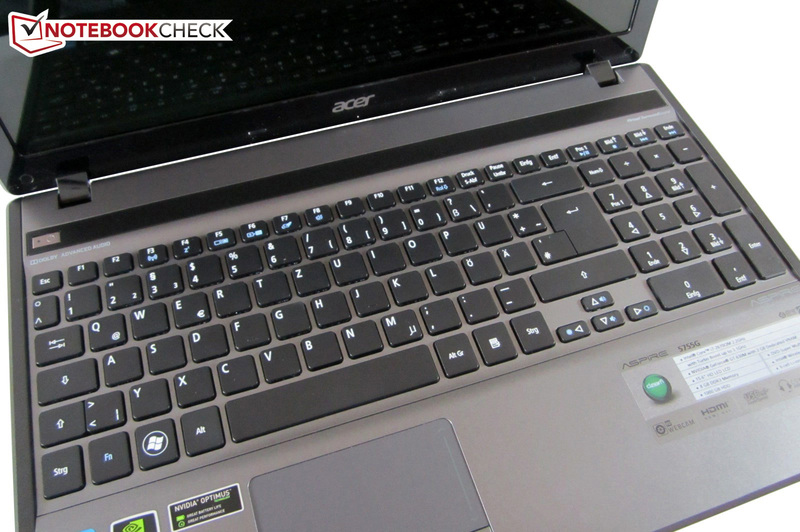 Why does Acer always use such tiny arrow keys? 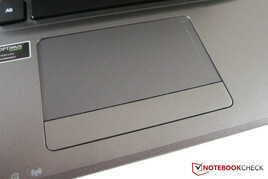 The smooth touchpad supports several gestures. The front has a card reader. 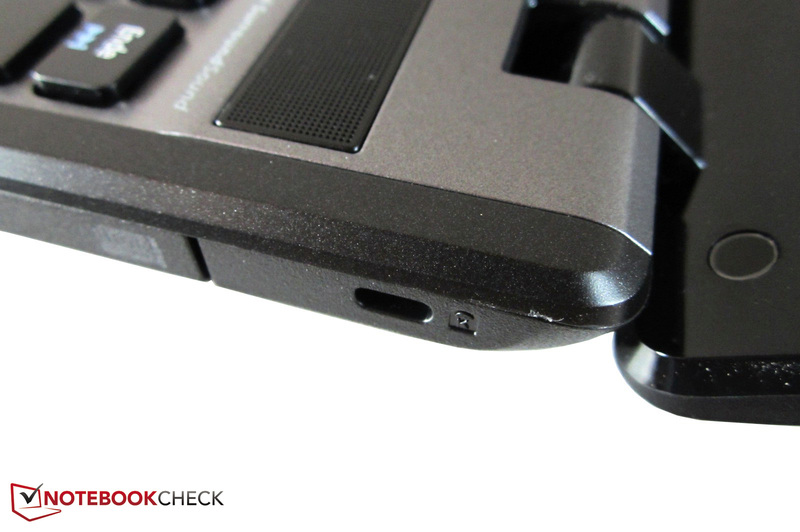 USB 3.0 is becoming standard. No one will be surprised about the Kensington lock. Wireless Internet is possible via WLAN. Of course, an external monitor can be connected. A quick start guide and warranty card is included in the scope of delivery. Eight GB of DDR3 RAM should suffice for the next few years. The Toshiba HDD supplies a good speed. All have a silver gray keyboard area and wrist rest in common. The high gloss lid is extremely sensitive. The case is completely made of plastic. The screen mirrors the surroundings in daylight. The notebook only weighs 2.6 kilograms. The display has a fairly wide opening angle. The rear doesn't have any interfaces. 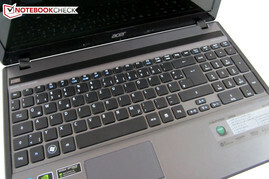 Acer has done a good job with the input devices. The lid has a fine line texture. As usual, there is a maintenance cover on the bottom. The optical design is a success in our opinion. The fan outlet is on the left. Acer has installed the optical drive on the right. Only two screws have to be removed to open the maintenance cover. Acer only allows access on the RAM, hard disk and WLAN module. We would call the power adapter handy. The fan doesn't get unpleasantly loud during load. 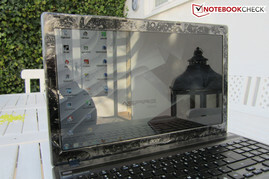 A feasible screen - preferably with a non-glare surface. The components' high temperature development. 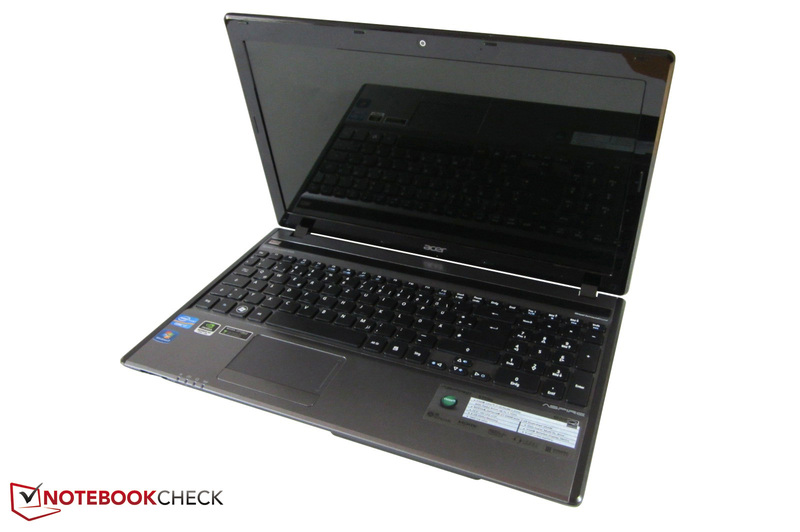 15 inch all-rounders with a Sandy Bridge processor and a gaming suitable graphics card, such as the Acer Aspire 5951G, Asus N55SF, Dell XPS 15, Medion Erazer X6815, Samsung RF511, Samsung 700Z5A, or the Schenker XMG A501.